Healthy gluten-free sourdough? Yes, it's totally possible… and it's delicious! 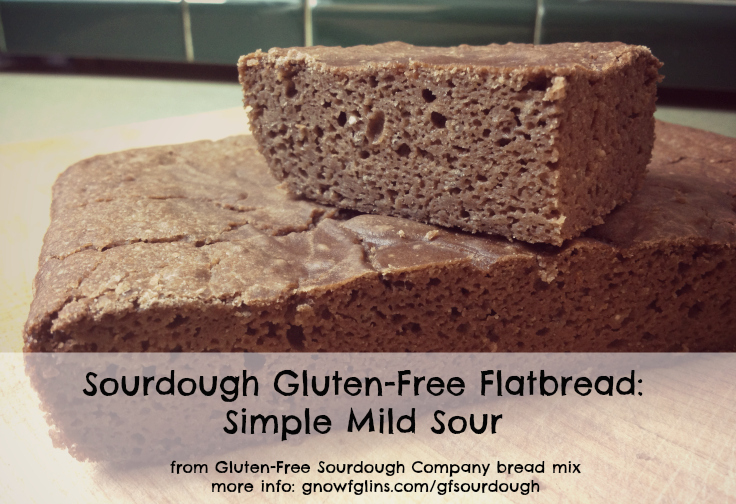 In this week's Allergy-Free Cooking eCourse, we are working on gluten-free sourdough. It's pretty fun, so I uploaded one of the lesson videos to YouTube so you can check it out, too. What's happening in the video and picture above? 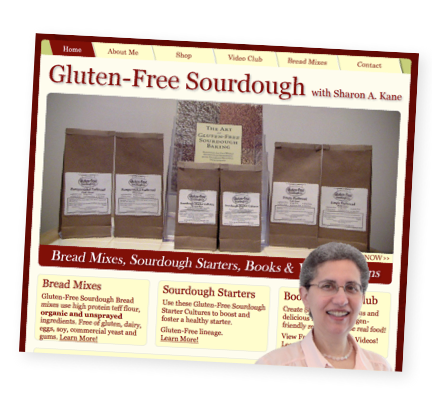 Sharon Kane, the expert gluten-free baker behind Gluten-Free Sourdough Company and the author of The Art of Gluten-Free Sourdough Baking, has launched a product line of gluten-free sourdough bread mixes and starters. She sent me a few bread mixes to try, and my family absolutely loves them. I made a video to show you how how easy and wonderful they are! Like many great ideas and products, Sharon's bread techniques — and now mixes and starters — were born of necessity. She needed a specific kind of bread for herself. Over time, she perfected her skills and the techniques, and then started sharing the info with others who would benefit, too! Here's the story in Sharon's own words. Before being diagnosed with gluten sensitivity, I had developed — and mastered — a bread technique based on 7-day sourdough rye bread. I based my gluten-free experiments on this technique. It took one year to get a decent gluten-free sourdough bread and 2 more years to branch out using different flours. To share what I had discovered, I wrote my book, Art of Gluten-Free Sourdough Baking. The bread mixes are assembled at the Gluten-Free Sourdough Company, my own licensed, dedicated gluten-free, peanut-free, and vegan facility. I use glass and stainless steel equipment and when absolutely necessary, only BPA-free plastics. The outer packaging is completely biodegradable (being only paper with no chemical smells). Learn more about my products and production practices here. If you feel that you want the benefits of gluten-free sourdough but you're too busy or you're not getting good results when you try it yourself, these bread mixes may be just what you need! Sharon is really great. I asked her if she'd be willing to do something extra special for GNOWFGLINS folks who try her bread mixes. She said yes right away. Here's what you'll get — a FREE grain-free cookie with any purchase through March 31, 2014. These cookies are a brand-new product Sharon's been perfecting. She wants to make an ultra-healthy grain-free cookie based with sprouted almond flour. The ingredients are: organic, unpasteurized, sprouted almonds; organic shredded coconut; organic coconut oil; organic maple syrup; organic vanilla powder; organic mace; and organic chia seed. You'll get one of her grain-free cookies for FREE with any purchase at Gluten-Free Sourdough Company through March 31, 2014. Because these cookies are a brand-new product she's perfecting (it doesn't even have a name yet), Sharon would love to get your feedback about taste, texture, or anything else. Or ideas for the name! Tell me: what have been your experiences with gluten-free sourdough? Do you think these bread mixes would help? If you give Sharon's bread mixes, starters, or the cookie (yumm) a try… be sure to let me know what you think! Also see: My review of Sharon's book The Art of Gluten-Free Sourdough Baking. Like my free videos? Please use the buttons below to share this video with others. And subscribe to the GNOWFGLINS Channel on YouTube — you can give this or any other video a thumbs-up! helloi have roaming your site since im trying to be more conscious of what i eat to become healthier and since i i saw your past post from 2010 about kefir i have been researching and seems like something i want to try and they don’t sell any starter kits by my house in store and was wondering if you still had any kefir water/milk left? Do you know if the bread mixes can be frozen for some time? Or, should a person make the bread and then freeze it if he will not be eating it for a while? Thanks–looks good! Stephanie, this bread freezes very well. I would say you should freeze if you aren’t able to eat it by the 3rd or 4th day. Enjoy! So I see that this is label as Gluten Free while other sourdough breads are not. But yet sourdough is ok on gaps diet? My husband is rather sensitive to gluten but he loves bread and tortillas. We grind our own corn and he loves sourdough. Does regular wheat, cooked with sourdough count as ‘gluten free?’ or would it be ok for him to eat? Thank you for such a great website, I’m learning so much! I loved the cookies especially the sprouted almond cinnamon ones.I hope they will be included in a cook book soon??? ?